Shards of glass and ribs of jagged metal, splintered two-by-fours, sheets of galvanized roofing from a barn twenty miles away. Wreckage as far as you could see in any direction. “Look at the trees,” she said, sweeping the vista of twisted stumps and branches with her hand. We picked our way through what was left of our neighborhood. Some of the houses were utterly destroyed while others had been left untouched. One brick house looked fine until you noticed its roof was missing, everything inside sucked out and scattered by the terrible winds. You captured the aftermath of a tornado beautifully. Great use of the prompt. Just like their food, indestructible. Sod’s law that a McDonald’s would be the only thing left standing. Nice take. That is…exactly what people think and say. A snapshot of true life in tornado alley. Magnificent work! 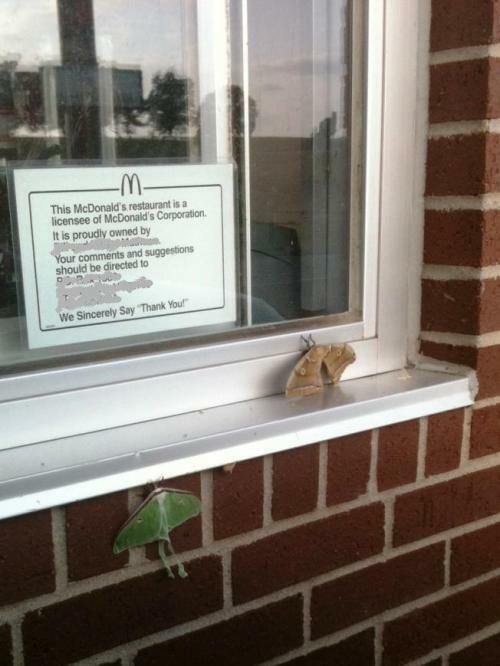 Wise moths know which buildings are tornado-proof. Maybe tornadoes are allergic to beef fat :) Very well-described! A great take on the prompt and of course it is only a fast food outlet left standing. Come next tornado, McDonalds will have the slogan: wait out the storm with a happy meal… Great story. Frightening devastation in these words. At least they can get a burger. McDonald’s will probably survive a nuclear holocaust. :) Great description of the destruction. How about moving that McDo line to the end? I didn’t want to have it be a surprise at the end. I think doing it that way cheapens it and makes it gimmicky. The meat of the story is really the house at the end, seemingly untouched yet utterly destroyed. The McDonald’s was a sop to the photo. If I was to make this a real story, I would cut it out entirely because it’s a redundant element. Churches, mosques and McDonald’s all unscathed. There must be a god somewhere.